Control of heating systems is entering a new dimension. The technical progress achieved thanks to fast development of communications (smartphones, tablets, etc.) is soon transferring onto ordinary home appliances. Now the time has come to get rid of all the knobs and dials. The new generation of temperature controllers follows in the direction of TFT screens – not only touchscreens, but also in colour. 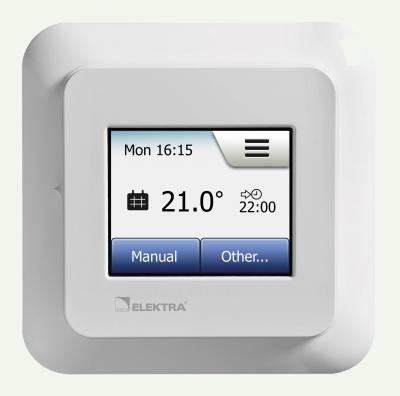 The ELEKTRA OCD5 temperature controller features no protruding elements such as knobs or dials in the front panel, thus becoming optically “friendlier”, and nicely fitting the living- or utility space. As in previous controller versions ELEKTRA OCD2 or ELEKTRA OCD4, the adaptable functionality is preserved, praised by the Clients. The controller “learns” the thermal inertia characteristics of the floor, and after some days already knows when to switch the heating on in order to achieve thermal conditions required by users at precisely set time. Undoubtedly, one of the advantages of the new controller is addition of the calendar. Thanks to this solution it is still easier to plan weekend outings or a longer holiday. We have grown accustomed to four-event programming or temporary temperature rise or drop. Now, six-event programming is hip. Additionally, control-via-sensors is available: using air and floor sensors – together or separately, where floor sensor is the limiter. ”The icing on the cake” is the concept of building the QR code in the menu, where all the controller setting modifications are stored, and also such information as energy consumption, or heating costs incurred. It is enough to scan the code displayed on the controller’s screen, and every information will appear clearly as menu lists and diagrams.